Discussing the career of the Unicorns of Love marksman Pierre “Steeelback” Medjaldi. 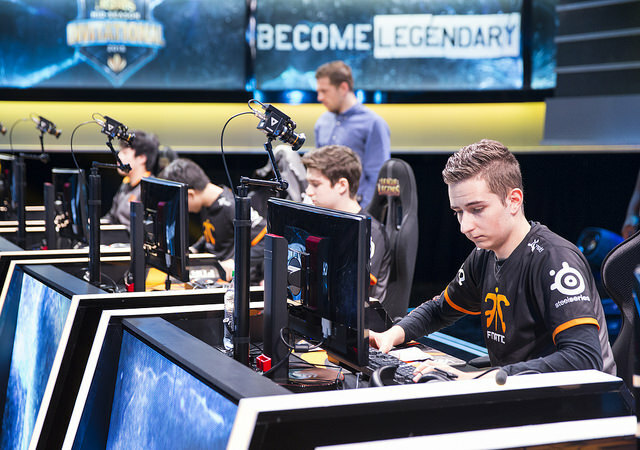 When Fnatic’s revamped 2015 EU LCS roster was announced tons of skepticism flew in the direction of the organization. Bringing in two Koreans, one a no-name practice squad player and the other a presumably washed up jungler, brought the ire of many European fans. Why reach to Korea when Europe was brimming with talent? In the background of the roster discussion, Pierre ‘Steeelback’ Medjaldi was handpicked by support Bora ‘Yellowstar’ Kim to fill in the duo lane. The rookie AD carry had only a few months of competitive experience on SK Gaming Prime, but Yellowstar saw promise in the 17 year old. Throughout the Spring, Steeelback received heaps from criticism due to his poor laning phase and general ineffectiveness when his teammates were not doing well. Fnatic fans craved for former AD carry Martin ‘Rekkles’ Larsson to return and for Steeelback to be whisked far away. Every other member on Fnatic had proved their individual worth throughout the split, but the young AD carry struggled whenever top laner Heo ‘Huni’ Seung-hoon and mid laner Fabian ‘Febiven’ Diepstraten failed to snowball matches. As a supplemental damage source and as a clean up marksman who took in the second lowest gold share for his position, 25.0%, his play was only just passable at times within regional play. In spite of this, Fnatic took the European crown that Spring, besting Unicorns of Love in the finals 3-2. Steeelback’s individual performances while on Fnatic ranged from awful to mediocre and his laning phase was a particularly sore area. At ten minutes, he was at a CS deficit in 17 of his 28 Spring split matches and was down double digit CS in 11 of those 17. His presence inherently put Fnatic in a hole they had to climb out of through timely teleport plays in the mid game by Huni and proactive engages by both Yellowstar and Reignover. Once Fnatic hit the international circuit at the Mid-Season Invitational, Steeelback’s play that was passable in Europe became a liability. Displaying horrendous performances during the group stage where he contributed an abysmally low 18.35% of his team’s damage, he was inarguably the weakest in his position at the tournament from a major region. Despite Steeelback’s performance, his team snuck through the group stage with a 2-3 record and matched against Korean champions SK Telecom T1. While Fnatic performed above expectations on that day, dropping to SK Telecom T1 in five games, Steeelback was soon replaced by the AD carry he was supposed to succeed, Rekkles. Deemed unworthy to be a starter for a team yearning to compete internationally such as Fnatic, Steeelback failed to find another starting position in Europe. Instead he found a home in the North American Challenger Series, with Odyssey Gaming, who eventually rebranded as Team Imagine. In the Challenger Series regular season and playoffs, Steeelback had standout carry performances including four victories over Cloud 9 Tempest between regular season and playoffs in which he recorded a combined 32-5-35 KDA. With the 2-0 victory over Cloud 9 Tempest in playoffs, Team Imagine earned their chance to play for a spot in the following LCS split against Team 8. The Steeelback led squad fell three games to one and their LCS dreams were quickly dashed. After being pushed out of Fnatic due to poor play and failing to make LCS with Team Imagine, Steeelback hoped to find a new home back in Europe. There the Unicorns of Love waited. The team he had taken the European crown from only a couple months prior was revamping their lineup after the departure of three players, jungler Cho ‘H0R0’ Jae-hwan, mid laner Tristan ‘PowerOfEvil’ Schrage, and AD carry Pontus ‘Vardags’ Dahlblom. The new Unicorns of Love lineup filled itself with cast-off wanderers similar to Steeelback and had critics unconfident in their prospective LCS results. As the lineup’s first test, the team headed to IEM San Jose. As quickly as they settled into the Californian city did they get ousted from the tournament, decisively dropping to Counter Logic Gaming two games to none. Moving forward, the team’s LCS endeavors would run counter to their IEM results, sprinting out to a surprising 6-2 record on the back of excellent play from support Zdravets ‘Hylissang’ Iliev Galabov. One of the two remaining players to stick with the organization, Hylissang guided the Unicorns through multiple jungle swaps during the first four weeks and meshed well with their new AD carry. Steeelback showed critics he shored up his laning woes – going from an atrocious -6.5 CS differential at 10 minutes with Fnatic to a solid +1.5. On top of Steeelback’s personal growth, this Unicorns of Love roster started to look far more cohesive than their previous iteration. Steeelback’s improvement was noted as his exceptional Kalista quickly became a near permanent ban against the Unicorns. With quality secondary carry performances coming from both mid laner Hampus ‘Fox’ Myhre and top laner Tamás ‘Vizicsacsi’ Kiss, the Unicorns showed a balanced attack from multiple angles. Their early game looked solid in the beginning weeks from the stifling pressure caused by jungler Danil ‘Diamondprox’ Reshetnikov, yet with visa issues came a myriad of roster swaps. Hylissang stepped up as the leader and helped guide Charly ‘Djoko’ Guillard, Rudy ‘Rudy’ Beltran, and Jean-Victor ‘Loulex’ Burgevin as they each entered the jungle at different times in the season. Despite Hylissang’s efforts, with the new junglers came expected declining results. With the roster in flux, the Unicorns of Love looked less cohesive and far less well-rounded than their start to the split suggested. As such, they zoned in on giving Steeelback the majority of the attention. With Hylissang guiding the new junglers all pressure trended around getting the duo lane ahead and keeping them safe. Gradually losing early game pressure, the Unicorn’s results faded as the season grew to a close – dropping six of their final ten matches. Steeelback, however, only appeared stronger as his team took on a more team fight focused strategy. In the final week of the season – fighting for playoff seeding – Steeelback delivered a heroic performance on Sivir against second seeded H2K Gaming, going 9-0-6, recording 100% kill participation, and winning three straight team fights all from a gold deficit to come from behind. Steeelback and the Unicorns entered playoffs squaring off against Origin. Like the Unicorns, Origin found themselves in mid to late game team fights often and placed the majority of resources onto their marksman, Outstanding Rookie of the 2015 Summer Split Jesper ‘Zven’ Svenningsen. Despite Steeelback’s best efforts, including phenomenal Lucian play in game two to nearly drag his team to victory, the Unicorns were swept by Origin in three games, leaving little doubt as to who the superior team was. Steeelback, however, matched his counterpart in the bot lane step for step individually, showing the world just how far he progressed in the year prior. Although his team results may never match what he achieved with Fnatic during his initial split, Steeelback’s individual play has improved tenfold. He has shown exceptional positioning in team fights and, alongside Hylissang, brought his laning to a proper level. While on Fnatic he was the supplemental damage source, rarely required to win. Once on Unicorns of Love, Steeelback came into his own and adapted to a more pressured, main carry role. With rumors of Steeelback wanting to leave the Unicorns abound, where Steeelback lands next split is anyone’s guess. Wherever that may be, his new team will be receiving a strong willed, adaptable carry that is just hitting the prime of his career. The promise Yellowstar noticed 16 months ago has finally appeared.